Group of Minds, a California-based marketing and technology company, has been tracking mobile use in the arts since 2009. 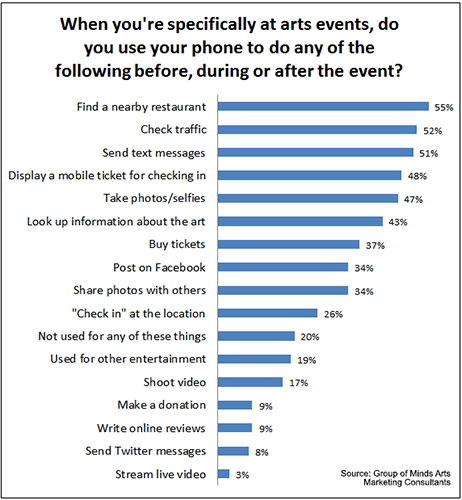 Its latest 2015 survey, titled “Arts Patrons: Mobile Preferences,” updates one conducted in 2012 by asking roughly the same questions of roughly the same populations. Growth in mobile use by arts consumers has been “profound” according to the Group of Minds survey: smartphone ownership rose to more than 91 percent of arts consumers in 2015, up from 50 percent in 2009. In addition, the number of people who used their smartphones to look up cultural events near their location doubled during the same time frame. Mobile ticketing, too, jumped, to 37 percent in 2015 from 21 percent in 2012 (it’s undoubtedly higher by now—the survey was published one year ago). And nearly 50 percent of the respondents in 2015 used their phones for ticket scanning at the venue rather than printing them out at home or waiting in the will-call line. More about the sample: 54 percent used Apple iPhones and iPads; the rest were Android fans. Wearable platforms, such as Apple Watch and Google Glass, accounted for about 1 percent of the pool. 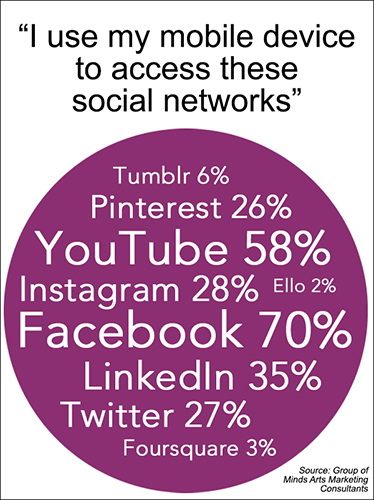 Social media and mobile are made for each other. About 70 percent of the 2015 survey respondents said they are on Facebook “all the time” and 58 percent are frequent YouTube users. Instagram showed up for the first time on the 2015 survey, claiming 28 percent of users. (All of the percentages were higher among the 13-32 respondents.) To state the obvious, social media’s facility for sharing—whether it’s buying a ticket to an event and telling friends, being there and sharing photos and comments, or writing about it afterwards—can be an enormous boost in terms of visibility and future sales. Presenters need to be paying more attention to the practical aspects of attending a cultural event, writes Evans. As the charts on these pages indicate, a night at the theater is more than just a play or concert. It’s the creature comforts of the venue, the traffic, the parking, nearby restaurants, the performance run time, the nature of the content—is the show appropriate for Aunt Millie? What’s the cell phone policy? Are they allowed in the venue? Can I take pictures? Is there a texting section? If there’s a bar in the venue can I buy a ticket ahead of time? Chances are the artistic experience is assured to be a good one. Why not offer it under optimum circumstances by making the best use of the technology already in people’s hands? 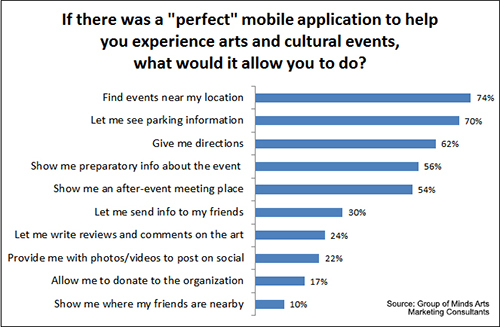 For the full Group of Minds report, see 2015 Update: Arts Patrons: Mobile Preferences.